It is my turn today on the MSP blog. I got out my ever-loved Misti and made this cute card using Honey Bee Mermaid Song and Ocean Borders. I used a new tool - the fabulous new Life Changing Blender Brushes to create the background. In a nutshell or should I say seashell, I stamped the large background with Versamark and heat embossed with white embossing powder. I then used the 2nd largest brush and 3 distress oxides to create the background - emboss resist technique. 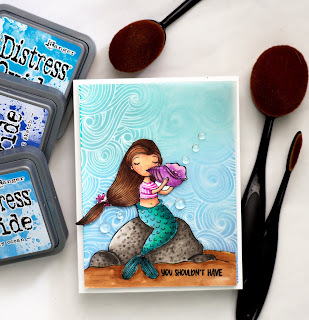 I stamped and colored in my mermaid with Copic markers - she is supposed to be an above water mermaid posing on rocks but I wanted her to be under the water. I decided you can blow a conch shell underwater too lol! I added a piece of vellum over the background and then adhered the mermaid. Super easy and super fun. I will be back with a review of the blender brushes. Product Supply Links: I am using affiliate links at no further cost to you. Hi, Susan! I stumbled across your site to watch your video. I love the card you created with the beautiful mermaid and great coloring. Your video was great also.